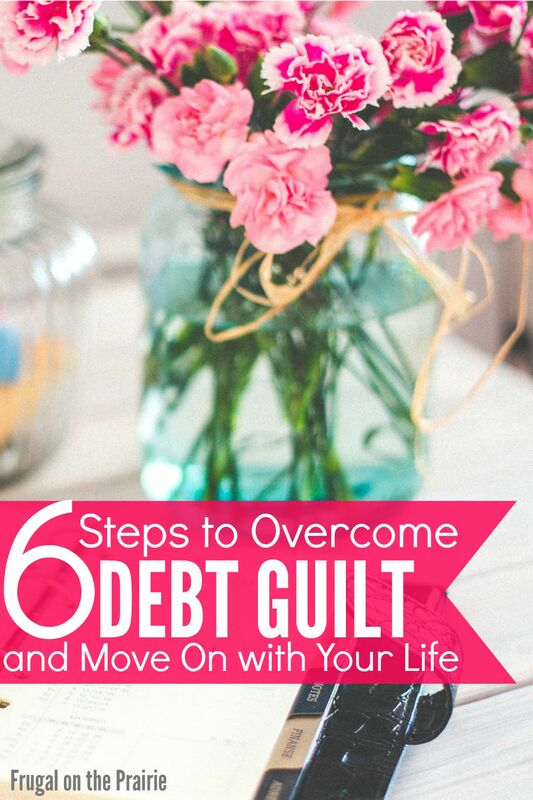 How do you overcome debt guilt and move on with your life? Having debt can be like having an irritating dark cloud that constantly takes away the sunshine from your day. You feel loneliness every time your friends go to a restaurant without you. And if you end up tagging along and spending money, you feel the shame for adding on to your debt balance. "I can't believe I let this happen," is a disheartening thought that can be difficult to silence. But it's time to get over that feeling and move on! Here's a little backstory to my own debt guilt. I worked multiple jobs throughout college and was also fortunate enough to receive scholarships and grants. But I still needed student loans. A lot of them. I should be very clear in saying that I chose to take out student loans instead of slowly paying for one class at a time. With my multiple jobs and time constraints, I estimated it would take almost 12 years to pay cash for the courses as I could afford them (This was assuming my income increased with the cost of tuition. Ha!). I weighed the cost of education versus the cost of time and in the end, education won. Three months after I graduated, we found out we were pregnant. Hooray! But my extreme sickness combined with our desire to have one parent stay at home convinced us to move from two incomes to one. My husband was supportive and thrilled about the decision. I was ashamed of it. I constantly told myself, "What kind of independent woman quits working and passes on all of her debt to her husband's shoulders?" Eventually, I overcame these ridiculous self-imposed feelings with the support of my very loving spouse. But I shouldn't have beaten myself up and here's why. Sometimes we choose to take on debt (mortgage, student loans, etc.) and later question whether or not it was a mistake. For the record, I would still make the same decisions and take the same path but that's a story for another day. If you have a lot of shame or depression about your finances, that's not okay. Yes, you have debt and should try to avoid it at any cost. Save and pay off as much as you can. But you still deserve to live in happiness and you can do it in 6 easy steps. First and foremost, you need to accept that your debt is a problem and that it is yours to handle. Don't blame anyone else for your debt, even if it really isn't your fault. Could you have cancelled the credit card if someone else was abusing it? Could you have avoided Target at all costs if you found their home decor section too tempting? Yes and yes. I made a mistake because I am human. But I won't let it define me. I have a goal to pay off my debt and Iwill succeed! Many times we find ourselves caught in the web of debt because of our resistance to believe we can actually climb out of it. You can climb out of debt but you have to first accept that it's a reality. Pointing the finger at someone else (even if it's an old girlfriend who took advantage of you and your credit cards) does not help. Also, being in denial or not knowing your exact amounts of debt doesn't help either. Take responsibility. No one appreciates a one-sided conversation. And even more so, no one can stand a pity-me friend. Yeah, you screwed up. You're in debt. We all understand and trust me you're not alone. But the pity party has to stop now. The only party you should be attending is the one where you celebrate each payment that brings you closer to the balance of $0. Ahh guilt. It's the weapon of choice with controlling parents and manipulative friends. It's a brutal and suffocating measure and it loves making you feel bad about your debt. Don't let it! Acceptance is one thing. But never-ending guilt could stunt your enthusiasm to pay off the balances. Let's think about the term "retail therapy" for a second. Some people (myself included) enjoy a good shopping session to relieve stress or to simply improve their mood. The concept is not foreign. Men and women have been doing it for years in the form of clothing, electronics, partying, and so on. But notice how being depressed about something could cause you to momentarily lose sight of the bigger picture. When I'm in a bad mood I may think, "Today has been a horrible day and I deserve to buy new clothes to make it better." No, I don't actually deserve them. But in that moment I become weak and usually overspend. Eat healthy. Sleep more. Exercise and enjoy the fresh air. Keep your body and your mind in good spirits so your finances can stay happier too. Do you think the New England Patriots won last year's Superbowl without a game plan? No way! Any football team will use strategy, have self-awareness, will learn from their mistakes, and maintain an encouraging mindset to win a game. Treat your finances the same way. Write down every penny you have in debt and put it up where you can see it every day. Place it on your front door so you can look at it whenever you leave the house. Type the amount in the Notes app on your phone and make that your Lock Screen. Create a realistic timeline and be firm with yourself. If you could pay off your debt in a year but think it will be hard, write that due date anyway. Now is not the time to give yourself slack! Knowledge is power when it comes to debt payoff methods. Get to the library, search on Google, or use whatever methods suit you and learn everything you can. Keep in mind that there is no one size fits all financial plan. We are unique individuals with very unique bills. Continue to search for a payoff method that suits your goals and amount of debt until you find the one that was meant for you. When I first started tackling my student debt I became a payment ninja. I closely monitored interest amounts and constantly hustled to earn extra cash to put towards them. Then we had our precious, wonderful, darling baby boy James who also happened to cost a lot in diapers. For a while, any additional income went towards baby gear and my loan payments went back to their normal schedule. I was disheartened to see the elimination process slow down. But I had a glass of wine, kissed James' baby soft head, and was thankful for everything I still had. Life gets busy and sometimes the fight against debt slows down. This is okay! The important thing is that you continue to make progress. Please don't walk away from this post thinking that debt isn't a serious situation. You should never look at your balances and say, "No big deal," because that won't help you move on to a happier life. If you follow these steps you can start to come to terms with your debt and will eventually gain a more upbeat outlook on paying them off. Do you suffer from debt guilt? How do you overcome it? "Should I get student loans?" If you are attending college or are thinking about going to college, it's likely you will apply for a mixture of grants, scholarships, and federal student loans. Sadly, there are some grave misconceptions by some of the students that utilize these loans. I had a friend tell me it was "free money" and that she wasn't worried about paying them off. Student loans are serious! There is nothing free about them. Before we get into the details of student loans, you should ask yourself if you really need a college degree. Personally, I am a strong believer in the power of a college-level education. Both my husband and I have college degrees and have already set up a fund for our child. But there are successful men and women who never received a degree, like the creator of Facebook, Mark Zuckerberg. So answer these questions honestly before you take out any student debt. Does the job you want require a college degree? Not all jobs require a college degree, like being a web developer or a medical secretary. Thoroughly research your dream job to determine if paying for expensive tuition is really the right path for you. Will your desired college degree provide enough income? Be realistic with yourself when you answer this question. Obviously, you can't tell the future but you can easily gauge the potential salary by doing research into the career. Not all jobs requiring a degree can provide an attractive salary. Steady income or not, you are still responsible for paying back your loans once you graduate. Did you answer yes to the questions above? Do you still need a student loan? Here are a few of the questions you should ask before you borrow. 1. What are the different types of federal loans? There are various types of loans and each one has different rules and requirements. Direct Unsubsidized: For undergraduate students. Loan amount is calculated based on your expected family contribution. Direct Subsidized: For undergraduate, graduate, or professional students. Direct PLUS: For graduate or professional students, as well as parents of undergraduate students. Federal Perkins: For undergraduate, graduate, or professional students with exceptional financial need. You are responsible for paying either all or some of the interest that accrues on these loans while you are still in school. The only exception is with a Direct Subsidized loan, where the government pays for the interest until you have graduated or left school. 2. What is the difference between variable and fixed interest rates? The interest rate you receive will depend on the type of loan you apply for, either federal or private. Federal loans (listed above) have a fixed interest rate, meaning the interest rate you are given when you accept the loan will remain the same during your payback period. Private loans may have variable interest rates, which are subject to change and may dramatically increase the payoff amount of the loan. 3. When do I start paying back my student loans? You are required to begin paying back federal student loans once you have fallen below a half-enrolled status or have left college entirely. If you have graduated, there is a 6 month grace period. The payback schedule for a private loan usually begins immediately after you have signed the loan papers but each lender has different requirements. 4. What if I can't repay the loans? Pay close attention to what you are expected to pay back and when! You may qualify for deferment or forbearance if you are unable to make payments on the loan(s). A deferment will simply postpone the payment while a forbearance will temporarily suspend or reduce your payments, given the approval of your lender. Keep in mind this is only allowed under extreme conditions. If your salary is exceptionally low, you may qualify for an income driven repayment plan where you pay a percentage of your income. This may make your monthly payment lower but I would advise you to consider paying the full amount if you can find the room in your budget to do so. The loan and it's accruing interest will never go away until you have it paid in full. 5. Am I eligible for loan forgiveness programs? There are various types of loan forgiveness programs that can be reviewed on the government's Federal Student Aid page. You may qualify for one depending on the type of loan you have, your length of employment, the number of payments you have already made, and many other factors. These programs are very specific to an individual's situation. Don't count on one or the other to completely erase your student debt. 6. I failed to make the scheduled payments on the loans. How will this affect me? It causes a negative effect on your credit score. Your wages can be garnished each month. A damaged credit score doesn't just affect your ability to finance a home or a car. It can also hurt you ability to sign up for utilities or rent an apartment. You should avoid missing payments or defaulting on your loan at all costs! 7. Is there a penalty for paying the loan in full ahead of schedule? It's fantastic news if you find yourself making more than the minimum payment and on schedule to pay off the loan early! Fortunately, there are no penalties in doing so with your federal student loans. But you will need to check with your private loan lender to determine if there is a fee. 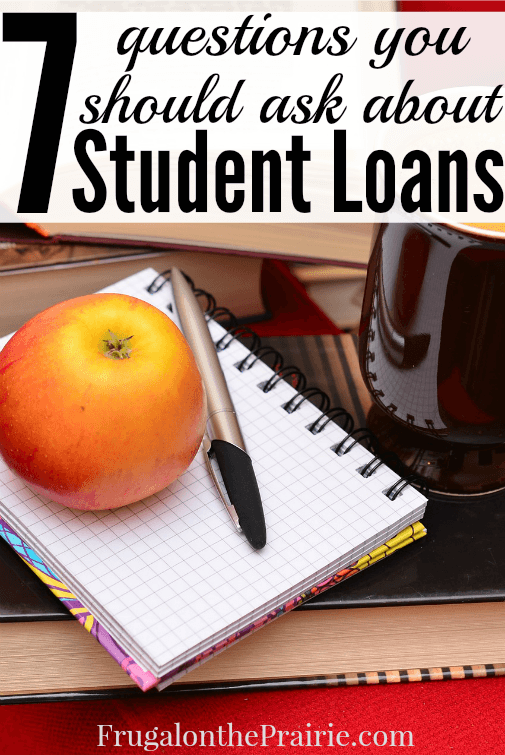 Now that you've answered these questions you should have a better idea of the basics involved with receiving and paying a student loan. Make sure the expense of acquiring a degree is right for you before you run out and start paying for tuition. Be honest with yourself about the income you can be expected to make once you graduate. By paying close attention to the different types of student loans you will be able to make an informed decision about the kind you need and the schedule of payments that will be expected. Good luck! Do you have student loans? What questions do/did you have? Note: This post is for informational purposes only. Please consult with a professional loan officer before applying for a loan.